Chakri Day in Thailand is on April 6th each year and celebrates the establishment of the Chakri Dynasty by Phra Buddha Yodfa Chulaloke in 1782. 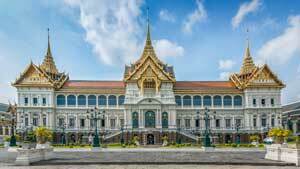 At the royal chapel the King will hold religious ceremonies and later pay his respects at the Royal Pantheon to his predecessors, the eight kings of the Chakri dynasty and lay a wreath at the King Rama I statue at Memorial Bridge. This is a national holiday with government offices and some business offices closed. King Bhumibol Adulyadej, is the ninth king is the longest reigning monarch in the world. Provides calendars for the calendar year for Thailand. Provides the dates for holidays for the calendar year for Thailand.